Dr. Dane B. Cook is a Professor of Kinesiology at the University of Wisconsin – Madison and a Health Science Specialist/Research Physiologist at the William S. Middleton Memorial Veterans Hospital. He also holds an adjunct appointment within the War Related Illness and Injury Study Center of the New Jersey VA Health Care System. Dr. Cook is Director of the Exercise Science laboratory at the VA Madison and Co-Director of the Exercise Psychology laboratory at UW-Madison. 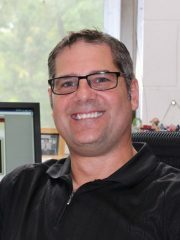 He is the current sitting Chair and Director of the Marsh Center for Research in Exercise and Movement. Dr. Cook’s research focuses on the psychobiology (i.e. the relationships between biology and behavior) of exercise with a specific focus on how exercise influences the central nervous system in both health and disease. Much of this research uses functional magnetic resonance imaging (fMRI), in conjunction with biological and behavioral outcomes, to understand central nervous system mechanisms of pain and fatigue in patients with fibromyalgia (FM), myalgic encephalomyelitis / chronic fatigue syndrome (ME/CFS) and Veterans with Gulf War illness (GWI). These studies combine exercise science and brain imaging methods to better understand these diseases. More recently, Dr. Cook’s research has begun to incorporate additional biological systems, such as the immune, autonomic and gut microbiome to better understand how distinct yet related physiological responses interact to maintain illness. Dr. Cook’s research has received continuous federal funding for the past 15 years principally from Department of Veterans Affairs and the National Institutes of Health. His laboratory is currently testing how acute exercise influences autonomic, immune and brain responses during pain and cognitive challenges – a mechanistic study of post exertion malaise in Gulf War Illness (Merit Review Grant Award: I01CX0011329-01). In a separate project (Merit Review Award: Grant # 1I01CX000383-04), Dr. Cook’s lab is examining symptom, physical activity and brain responses to resistance exercise training in Gulf War Veterans with chronic musculoskeletal pain. This randomized controlled trial aims to determine whether weight-training is an effective treatment for Veterans with chronic muscle pain and whether treatment effects are related to changes in brain structure and function. Dr. Cook’s students study a range of exercise psychology topics including aging and dementia, depression and athlete over training and staleness.